David is a good golfer. He has talent, commitment and a keen desire to improve. But he has been struggling. The reason? He is impatient. He is expecting too much and trying to play perfectly. The result? He gets tight. He plays safe and he is not letting go. And this is the hard part. To change his current form he needs an attitude adjustment. His adult mind is throwing him all the reasons why he isn’t playing better. He needs to stop being so harsh on himself and put some trust in his learning ability. Here’s three simple steps to get started. This strategy gives no room for excuses. Either he has the guts to do it or he doesn’t. And one more thing. He needs to stick with it. There’s no short cut or quick fixes here. After a month or two of following this approach I’d be surprised if he hadn’t left his golfing slump behind. Yes he needs to let go. I think I am starting to get it – and it works! At the weekend I had my best score for over 2 years and I managed this despite getting myself into some tricky situations. The difference was that I just decided what I wanted to do, followed my routine and then did it. For example on the par 5 16th I put my second shot into a bunker running across the fairway. I decided my plan was to get out of the bunker sideways and then get up and down for par from the 80 yds that were left. My pitch finished an inch from the hole – par ! I then finished the round with another 2 pars despite having to get up and down. No worrying about my swing and no worrying about where the ball went. Just going through my routine and then hitting it. Can’t wait for next week now! great result. It’s good to see that others are discovering what is capable when you relax, go through your routine and just play. It turns ordinary golf into extraordinary. Gregor a word of advice. Stick with it. I’m saying this because I don’t won’t you to fall int the same trap I did and that is Ithen tried to improve on what worked for me. The best part about auto golf is that you already have the tools to allows you to play great golf. @Gregor: Well done. You are making fantastic progress. The game of golf will throw many obstacles your way. Rarely will any golfer hit all the fairways and all the greens. It doesn’t happen. Even Tiger misses his fair share of both. So you need to have a strategy to deal with the poor shots. Automatic and letting go is the best strategy that I’ve found. The good thing is that you’re now looking forward to playing. This is a sign that you’re passed the ugly stuff. @Steady: Good advice. Adults have this terrible habit of changing things when they have success. We keep searching when we don’t really have to. As a recent convert to the auto process I believe the first and most important part is to be totally and un wavering to the auto process.Once you make that commitment you can deal better with the hiccups along the journey? I had a game the other night after work and unfortunately it wasn’t as good as previous games. But once I finished I didn’t start to question mentally why and how I hit the ball badly I just accepted it wasn’t a great night and looked forward to my next oppurtunity to have a hit, hopefully with a better result!! While I played this round I remained focussed on trying to play auto- each shot I would try and maintain the same routine-select my club stand behind the ball pick my target and start counting. I sometimes have a tendency to stop counting before I’ve completed the shot. This is an area I will continue to work on!! But I know there will be good and bad shots. I feel a bit sorry for David above but those things are his to work out by using your good advice. Number 1 above has been a stumbling block for me but I’ve decided that what I used to do years ago is appropriate and will be applied from now on – and automatically should therefore be much easier! Question:- Do you feel that counting can be too automatic and that something needing more attention in the mind might make make the swing even more automatic. Have you experimented with other more intense non-golf thoughts? Have any of your devotees? DP in relation to counting, I had a great conversation with Tony Lucas on this on Monday night. He sings a song I count. But what struck was Tony’s comment when He said when he tried counting That ‘he would count bakwards from a random number’. Lets say for instance the number 37. You would then count 37,36,35,34 while walking to the ball and executing your shot. You mentally have to think about the number coming next. Not worrying about you grip, posture alignment, straight left arm etc. It makes sense because you are engaging your conscious mind while letting your subconscious mind play golf. BTW Tony went back to singing a song because THAT IS THE WAY HE WANTS TO DO IT. I recently watched a video from Cameron. For years I wanted to go back to playing a draw in a majority of my shots. I was too scared to do it because I thought it may ruin my score, make me look silly in front of my playing partners or any other bs excuse. I realise if you want something badly enough you want care if you look bad or be to scared to do it. Scars aren’t found on cowards. I’m playing on Saturday at Howlong, monthly medal, we’ve got the Murray Master pro am on all week next week. So the course will be set up to hard, fast and challenging. I’m looking fwd to playing with my gentle draw. Why? Because that is the way I WANT TO PLAY. WITH A DRAW. So play the way you want to. Not what a text book dvd or golf magazine tells you should play. Find out what works by counting singing etc, but always play from you heart. You will be amazed at what is possible and how well you can play. It is hard at times and daunting but the results are worth it. Patience, mental toughness and discipline are the keys to make auto golf successful. But most of all don’t give up. I now count, why because it is second nature for me, it is what works for me. I hope this helps. Remeber do what is right for you. PS don’t pick a number like 230046. You will only confuse yourself. Keep it simple. Between 20 and 90 is fine, unless your Rainman. @ Ray: Not analysing too much (I call it making up stories when you do) is a good start. 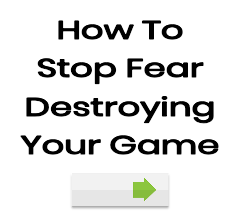 It keeps your mind clear and maximises your chances of playing better next time. There’s no need to panic after a poor round or two. Golf is difficult. You’ll always have some bad days – keep swinging freely and you’ll be just fine. You need to stay disciplined throughout the shot. This is the most important part of your stroke. @DP: Firstly this story is not about you :). There is another David that I know. Anyway, if you can’t work out what you want to achieve you’ll always be in trouble. So exercise those mind muscles and choose ONE objective for each shot. You can do it. I have been counting for years. It has become automatic for me now so I probably will do it forever. You can change it up if you find it gets boring. @Steady: Good advice as usual. Good luck on the weekend. We can compare notes on Monday. I knew it was not about me when I read the first sentence! You say counting is now automatic for you – that is my point, is it now too automatic and perhaps not as effective as when it took more concentration to count? Do you count faster for a full swing and more slowly for a putt or is a constant counting speed more important. Can’t help analysing, sorry. @DP: I don’t think you can be too automatic. The entire idea of this approach is you get out of your own way and perform the swing at a subconscious level. I don’t analyse as much as you 🙂 I think you need to count in a way that feels good for you. Stop analysing! Learn to go automatic and the story will fall into place.